When I think about the first tube of luxury lipstick that I ever bought, I’m 99% positive It was Givenchy. Or was it Armani? Either way, I was looking for an experience. Something about splurging on makeup made me stand up straighter and feel more assured. I was working a dead-end job at the time and it was my way of escaping the mundane. Some people have alcohol or drugs, I’ve always been drawn to lipstick and fashion. Call me vapid or uncreative but my infatuation for clothes, shoes and makeup is deeply rooted in who I am. When I was seven my mother didn’t allow me to wear nail polish so I would collect those hideous orange grocery store price stickers and apply them to my nails pretending they were freshly painted. Clearly I had a wicked imagination. When I was thirteen I would lock myself in the bathroom along with my mother’s makeup up bag playing with all of her lipsticks, imagining what it would be like to be grown up and wear red in public. Yup, some girls dream about their weddings, I was dreaming about makeup. Today I am the proud owner of an extensive collection of red red lipstick, all varying in shades and formulas - from sheer to mattes to ultra (lip drying) mattes. Givenchy’s 304 Mandarine Boléro makes to cut as one of my all-time favourites and one I’ve repurchased most. It’s muted red-orange that’s gorgeous on most skin tones and makes olive undertones come to life. One of the things I adore about the Givenchy makeup line is the leather lipstick cases that’s so true to their chic rock and roll aesthetic. Their formulas are creamy, hydrating, fully pigmented, never drying, and let’s face it, they look fabulous displayed on the vanity. In fact, their full line of makeup range won’t disappoint. The Prisme Libre powder is a favourite of mine and I have just discovered the Teint Couture Radiant Drop, a sheer rose-tinted highlight that’s awesome for mixing in with foundation or adding to the face for gorgeous glow. 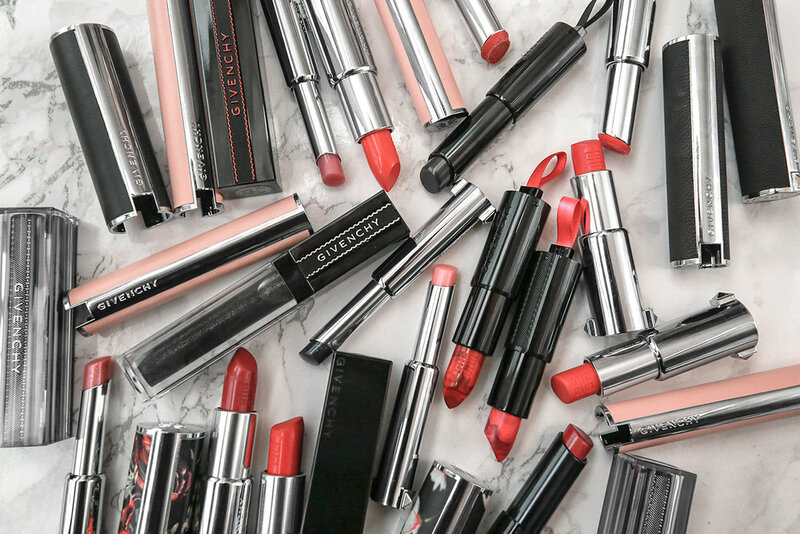 From sheer tined balms lip-plumping balms to marbled lipsticks and limited edition shades in leather floral cases, my Givenchy collection is pretty modest considering that I could easily go overboard. I ADORE these lip plumping balms. Sure, I can go out and get some Burt’s Bees (no shade, truly love them), but these balms are ridiculously luxurious - from the pink leather packaging to the actual formula itself. They adjust with your natural PH balance to create a custom sheer pink that’s pretty and natural and individual on everyone. The Givenchy Le Rouge Lunar New Year edition lipstick in the shade 325 Rouge Fétiche, a stunning cool red that’s both bold and classic. View the the full story here. This post contains affiliate links and items received as PR.